The plot is basic Sci-Fi fare but the screenplay smartly doesn't fill you in on all the details at the beginning of the movie. They keep handing you tidbits along the way so it keeps things interesting. 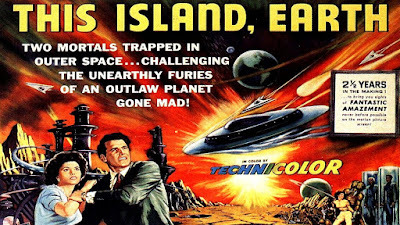 The only weakness in the screenplay is that is is awfully wordy, but that's pretty typical of 50's Sci-Fi were they tried to explain EVERYTHING. Lots of pseudo-science abounds but, hey, that's part of the fun! This Island Earth was also cast well. Rex Reason [The Creature Among Us] has a commanding presence on the screen as the scientist who kind-of saves the day. He has quite a booming voice which works to his advantage here. Faith Domergue [It Came From Beneath the Sea] is his sidekick, who is a scientist as well. However, this is the 1950's and her character is not exactly a self-empowered woman! Still, Domergue does a good job with the role. Finally, Jeff Morrow [The Creature Walks Among Us] is SPOILER ALERT Exeter, the Alien who is oh-so tan and has quite a five-head and quaff of white hair on top. [All the aliens look like this!] He give his character enough depth that you feel sorry for the guy in the end. Last, but certainly not least, is the mutant monster whose costume is really well-done. He's given very little screen time and it makes you yearn for more. I actually have a figurine of this monster as a part of the Universal Monsters Little Big Heads Collection. They are a fit hard to find but are really well done. So, grab this one off of YouTube and give it a go. You'll be glad you did!